I cut out this card using the Cricut Expression and the Wild Card Cartridge. Wild Card has so many unique shaped cards for different themes and holidays. It also comes with matching envelopes for each card shape. 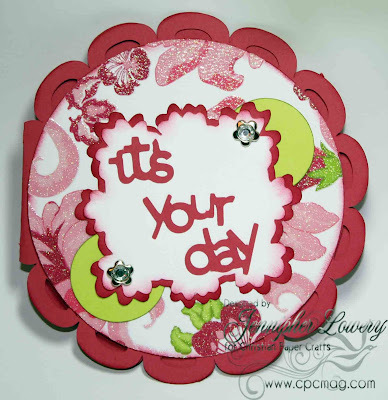 I used one of the new paper collections from DCWV called Blossom Song. It is one of the most beautiful collections I have ever seen from them. The base for my sentiment was cut from Storybook. This is another great cartridge! It has fancy corners and accents that are perfect for card-making. Your card is lovely! The colours are fabulous, and I love the cuts you used. Oh this is so pretty! I love these colors together. Beautiful card! I love that Blossom Song designer paper.